Paris: The Ultimate Mother-Daughter Destination. 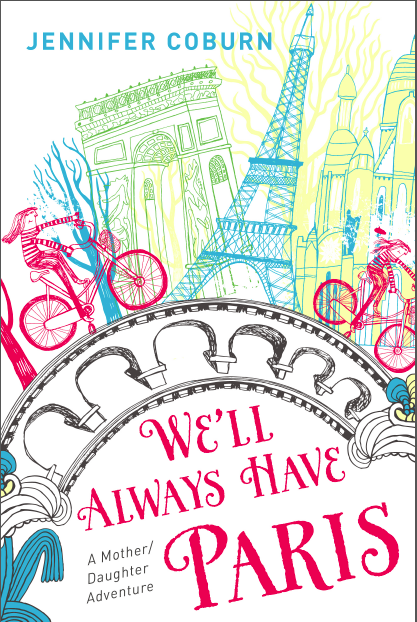 Guest post by Jennifer Coburn, author of "We'll Always Have Paris"
People speak about Paris with a dreamy longing, as though the city possesses a magic that cannot be found elsewhere. I’ve never heard anyone talk about Paris without sighing. The city is a Promised Land that holds appeal for most everyone: artists, lovers, even people who just like cheese. It is also one of the best places on Earth for a mother and daughter to connect. When my daughter Katie was eight years old, I decide to take her on her first trip overseas. Of course, I chose to visit Paris. No one ever asked why. The answer was simple; it was Paris. 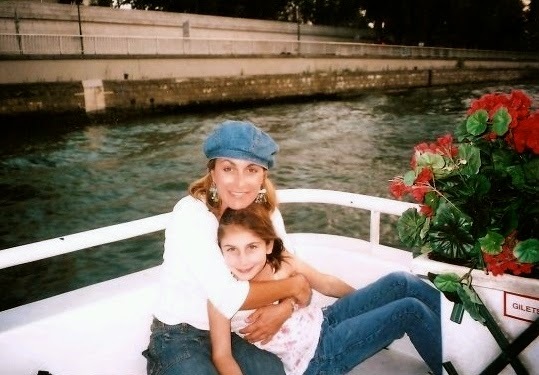 Years later, as I began writing a mother-daughter travel memoir We’ll Always Have Paris, about Katie and my adventures around Europe, mothers began asking for travel tips on visiting the City of Light with their daughters. I told them that if they were planning a mother-daughter trip to Paris, they probably already knew the major sites to hit. Travel guides always list the Louvre, Monet’s Gardens, and Versailles. Everyone knows they should go to the top of the Eiffel Tower. They’ve all heard about the Arc de Triomphe, Sacré-Cœur, Pompidou, and Notre-Dame, so I like to share my tips for lesser-known things a mother and daughter can share in Paris. 1) On your first evening in Paris, walk to Pont Neuf and catch the sunset cruise on the Seine River. Yes, it’s touristy, but what the heck, you’re tourists. This boat ride is a relaxing way to see some major landmarks. It also provides a peek at some hidden gems. 2) While on your river cruise, you’ll see several small pockets along the bank – almost like mini amphitheatres -- where groups of 20-30 dancers practice their moves. Katie and I enjoyed watching couples dance the tango, then moved on to another group dancing to salsa music. It made for great (free!) evening entertainment. 3) As you ride the river cruise, you will also see several tiny manmade “beaches” (Paris Plages) where lawn chairs and umbrellas are set out in July and August. Grab a book and few euro for drinks, and enjoy a relaxing afternoon watching the boats pass. 6) On our first trip to Paris, Katie and I almost skipped the Museum of Modern Art right across the river from the Eiffel Tower. Outside, it looked pretty grim with graffiti on the walls and skateboarders on the front steps. Inside was one of the most dynamic exhibits of contemporary art we’d ever seen. On our most recent visit, the museum had cleaned up its act, but still may still be overlooked by passersby. It would be a shame to miss this one. 7) If you can stand the stench, Musee Des Egouts, the sewer museum, is a fascinating tour of the underbelly of the city. Young children are usually thrilled by the gross factor, but adults are typically intrigued by it too. 8) Stop by the Shakespeare and Company Bookstore on the Left Bank. This converted monastery is a bibliophile’s heaven, rich with books, history, and a full calendar of special events. If you’re up for a real adventure, you can spend the night at the bookstore with other “Tumbleweeds.” I greatly appreciated the bookstore allowing us to sleep in its Writer’s Studio, but it’s nothing I ever want to repeat. Katie, on the other hand, had the time of her life. 9) Catch an old-fashion French puppet show in Jardin du Luxembourg. You don’t need to understand French – or be a child – to appreciate the silly drama on stage. While you’re there, plan to spend several hours in the park people watching or reading. Be warned, though: The French police are très serious about their rules, like not sitting on the grass. 10) My friend who spent a year in Paris suggested we ride the 14 metro (purple line), which takes riders on a fast ride from one end of Paris to the other. Sadly, Katie and I didn’t have time to do this, but we’re looking forward to our next visit when we will stand in the very front and take this high-speed tour of the City. The biggest mistake I made on our first trip was trying to do too much. When Katie and I had dinner at my cousin’s house, her French husband looked at my city map, which I had dutifully marked with color-coded stickers of Paris sites. I explained that the yellow stickers were where we’d visit on Monday, and pink stickers marked Tuesday’s destinations. He rolled his eyes at my American rigidity. “In order to know Paris, he said, inhaling his cigarette, “you must simply have a glass of wine, relax, and enjoy life.” It was the best travel advice I ever got. Jennifer Coburn is the author of We’ll Always Have Paris and a USA Today best selling author of six novels and contributor to four literary anthologies. Over the past two decades, Coburn has received numerous awards from the Press Club and Society for Professional Journalists for articles that appeared in Mothering, Big Apple Baby, The Miami Herald, The San Diego Union-Tribune and dozens of national and regional publications. She has also written for Salon.com, Creators News Syndicate and The Huffington Post. Coburn lives in San Diego with her husband, William, and their daughter, Katie. We'll Always Have Paris is her first memoir. You'll find Jennifer on Facebook, Twitter, Amazon and Good Reads. With special thanks to Jennifer for sharing her travel trips for Paris and generously offering to give a copy of "We'll Always Have Paris" to one lucky person. Please click here for more details about this exciting giveaway. ive always wanted to share my love of Paris with my daughter and have a bonding trip but sadly she won't leave ger young children. maybexine day when they are older sigh! Great suggestions! The river cruise is one of my favorite activities. I've been inviting my mom to Paris with me for 10 years. I hope one day she'll actually go. My husband, 10-year old daughter, and I leave for Paris in one week. This was perfect information - thank you!